The series Oxford Studies in Recorded Jazz currently consists of four volumes: Keith Jarrett's The Köln Concert by Peter Elsdon, The Studio Recordings of the Miles Davis Quintet, 1965-68 by Keith Waters, Benny Goodman's Famous 1938 Carnegie Hall Jazz Concert by Catherine Tackley, and Louis Armstrong's Hot Five and Hot Seven Recordings by Brian Harker. * In the preface to the series, editor Jeremy Barham writes that the collec- tion "offers fresh perspectives on both well-known and neglected jazz repertoire," and aims to "develop the subtle critical languages and vocabularies necessary to do full justice to the complex expressive, structural, and cultural dimensions of recorded jazz performance." One of the central issues permeating jazz scholarship, and indeed this series, is how to properly scrutinize recordings of a music that is prized for its ephemeral, spontaneous performance aesthetic, especially those recordings that are widely recognized as canonical texts. Moreover, the efficacy of transcriptions and the merit of their analyses is a hotly debated topic. The authors in this series are sensitive to these issues, and all provide a nuanced close reading of transcribed jazz performances within the larger social and historical contexts in which these recordings were created, mediated, and received. 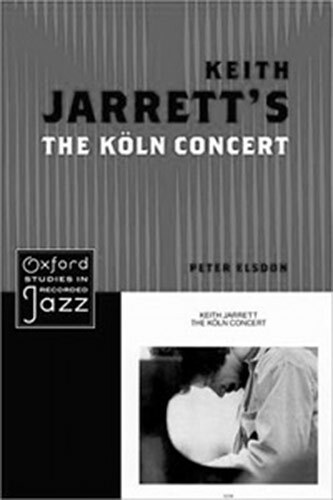 In Keith Jarrett's The Köln Concert (Oxford, 2013), Peter Elsdon explores the mediation of Jarrett's live performance through the lens of the personal listening experience. He notes that a recording of a live jazz performance often carries with it the cachet of being an authentic, immediate representation of the moment-to-moment improvisational process, unencumbered by the revisions and editions of record producers and engineers. Elsdon rightly points out that recordings of live performances are subject to the same studio processes, but that this idealization of live recordings was especially common within the cultural milieu in which The Köln Concert was widely consumed and acclaimed. The ECM label—and producer Manfred Eicher in particular—aimed to capitalize on this idealization, and to "imbue [the record] with qualities of liveness" (Elsdon, 10). Jarrett's seemingly mystical improvisational aesthetic was a selling point to his fans in the 1970s, and garnered him crossover fandom from other genres. To further create a sense of immediacy and liveness on the album, mediating factors including the album cover (a photograph of Jarrett seated contemplatively at the piano bench, head down into his chest, seemingly in prayer), track listing (organized into two "Parts" rather than song titles), and Jarrett's ubiquitous vocalizations throughout the performance are all contributing factors to the listener's ability to engage with the recording on a personal, immediate level. It is in this way, Elsdon proposes, that the recorded product functions as artifice, somewhat disguising the fact that it has been subjected to these mediated processes. Elsdon's analyses illustrate the ways in which Jarrett's solo piano style evolved in the years preceding the Cologne recording, and highlight underlying formal structures that ground much of Jarrett's performative decisions, as well as his proclivity for diatonic harmony and his extensive use of "groove" passages to navigate in and out of improvisatory sections. It is in his discussions of Jarrett's groove passages that Elsdon's analyses really shine. He critically traces the path of groove through its general musical qualities, its use in boogie-woogie piano styles, and Jarrett's earlier adaptions of the technique. Finally, he demonstrates how Jarrett employs groove in The Köln Concert, for which he offers a number of possible expressive interpretations. 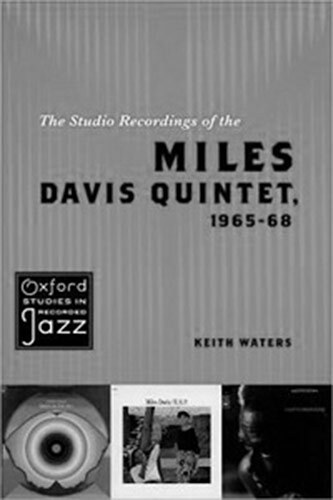 In terms of analytical artistry, Keith Waters's The Studio Recordings of the Miles Davis Quintet, 1965-68 (Oxford, 2011) is the most exhaustive, instructive, and impressive in the series, and a new seminal work in Davis scholarship. Considering the complexity of this group's compositions, improvisations, group interactions, treatments of form, meter (and hypermeter), and harmony, Waters's analytical prose is surprisingly cogent. He abstains from a single analytical methodology, and instead adopts a malleable approach that draws on both familiar and novel analytical models, all tethered to the equally pliable musical aesthetic of the band. Waters is also well-versed in the relevant literature on the band and its individual members. He eschews the uninformed historical narrative that presupposes Davis's autonomy in forging musical direction, and clears up the misconception that this band worked similarly to Davis's previous quintet, which privileged first takes in the studio. The availability of alternate takes, in-studio dialogue, and first-hand accounts by the musicians themselves offer valuable insight into the quintet's experimental studio processes. By revising and rearranging tempos, feels, harmonic progressions, rhythms, and melodic statements, this quintet treated the studio space and the recording process as dynamic supplements to compositional, formal, and improvisational processes. 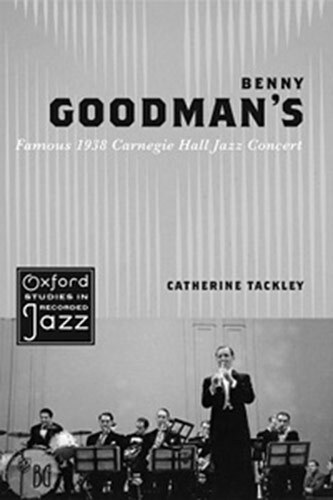 Catherine Tackley's Benny Goodman's Famous 1938 Carnegie Hall Jazz Concert (Oxford, 2012) offers an insightful unpacking of the historical events and people behind the organization, recording, performance, and dissemination of one of Benny Goodman's landmark recordings. Tackley arduously parses through all of the contemporaneous literature—newspaper reviews and articles, program notes, first-hand accounts of musicians and audience members—pertaining to the 1938 Carnegie performance, as well as the subsequent literature concerning the 1950 LP and 1999 CD releases. In doing so, she excavates an intricate reception history of the music, considering the inter-generational audiences at whom the concert and its subsequent releases on record were aimed, as well as the shifting historiographic modalities within which critics were writing. Her literature review is coupled with an examination of the recording's mediation through production design, cover/sleeve packaging, original and modified program notes, inclusion and exclusion of audience noise and responses. All are succinctly summarized in provocative but easily digestible prose. Tackley's musical analysis in "Part II" (which accounts for the bulk of the book), however, is a lackluster component in her study. Every track on the recording is studied to some degree, and much of these analyses draw from Tackley's personal transcriptions—an assiduous undertaking on her part to be sure. Yet much of what the reader evinces from these conclusions is disproportionate to the time, work, and space devoted to their presentation. At times, Tackley misses opportunities to tease out a more fruitful analysis that would be germane to, and thus enrich, the wonderfully astute work she offers in Parts I and III of her study. Her comparison of Benny Goodman's and Harry James's respective solos on "Life Goes to a Party" seems to miss the mark completely, making interpretive claims that are unsubstantiated by the music's auditory import. Underwhelming musical analysis aside, Tackley's historical realizations here are fresh and elucidating. Her findings from investigating the critical receptions of the performance and its different disseminations on record are well-nuanced and effectively deployed throughout her study. 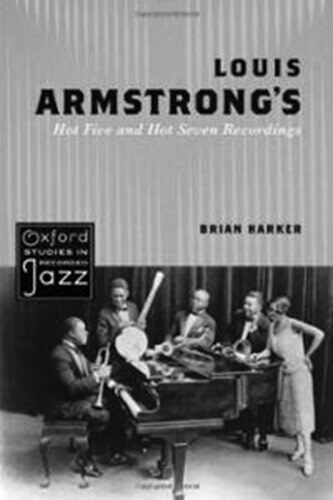 In Louis Armstrong's Hot Five and Hot Seven Recordings (Oxford, 2011), Brian Harker highlights Armstrong's evolving trumpet style during the years of these beloved recordings. Chapters are laid out chronologically, each chapter devoted to one of Armstrong's celebrated pieces: "Cornet Chop Suey," "Big Butter and Egg Man," "Potato Head Blues," "S.O.L. Blues/Gully Low Blues," "Savoy Blues," and "West End Blues." The analyses of these recordings are made especially instructive by Harker's situating Armstrong's performative choices within an overarching narrative that traces Armstrong's ambivalent view of his own socio-cultural status. This ambivalence was culturally informed by his own personal history, relationships, and views on the ideas espoused by writers like W.E.B. Du Bois, Booker T. Washington, and Dave Peyton. Musically, Harker demonstrates this ambivalence through Armstrong's coupling of novelty and polish in his performances. His affinity for vaudeville, classical trumpet etudes, the novelty and precision implicit in a trumpet replicating the jagged arpeggiated figures of a clarinet, and the echoing of popular dance rhythms con- temporary with these records' release, were all cultural codes that are subsumed in Armstrong's trumpet work in these recordings. Armstrong's stop-time solo on "Potato Head Blues" is representative of this reading. This solo is widely considered a turning point toward a more vertical, harmonically-based approach to improvisation—a marked shift in the paradigm of jazz solo improvisation. While this realization is not altogether inaccurate, it does not tell the whole story. Harker enriches and expands our conception of this performance's historical import by considering it not as a necessary, artistic expres- sion of a new aesthetic of jazz "improvisation"—a term Harker also problematizes provocatively—but rather as a calculated, polished solo on which Armstrong had clearly been working for some time. Armstrong had no aspirations of rewriting the lexicon of jazz soloing style with "Potato Head Blues," but instead aimed to imbue the performance with certain cultural codes. His analysis presents an enlightening examination of Armstrong's famous 1928 recording of "West End Blues." Here, Harker points to numerous instances where Armstrong draws on "hot," "sweet," "classical," and "gutbucket" styles within this single performance. Despite the challenges recorded jazz performances present to critical study, the volumes in the Oxford Studies in Recorded Jazz series prove these mediated artifacts are worthy of close examination. Recordings "offer data points that can be charted in retrospect, and compared with relevant contemporaneous events, to perceive historical patterns of which [the performer] might have been unaware" (171). Brian Harker's words concerning Louis Armstrong speak on behalf of all of those for whom analysis of jazz recordings is an ambivalent undertaking: "If we are chastened by a recognition of all that records leave out, we may nevertheless appreciate the powerful reflection they give of Armstrong's waking world in the 1920s" (171). As of the printing of this review, a fifth volume, Gabriel Solis's The Thelonious Monk Quartet with John Coltrane at Carnegie Hall (Oxford, 2013), has appeared.